If you walk into a bookstore or a library, you will find thousands of books that will tell you how to make more money. And if you already have lots of money, there are thousands of books that will tell you how to manage your money in such a way that you will make even more money. How to not . . . push money away from you. This may strike you as being a rather unnecessary skill. Who would push money away from themselves? Well, fact is, lots of people do. You may know at least one successful person who “grew up poor,” and now, even though they have lots of money, they can’t bring themselves to spend any of it. You may know someone who is talented and dedicated, and yet success eludes them; they hesitate to charge anything for their services, because they can’t see any “value” in what they do. And have you ever tried to give someone a gift, only to have it rejected because they felt they did not “deserve something so nice”? If so, then you have seen “poor kid thinking” at work. And that’s just the beginning. So here you have a slightly different “money management” book. Unlike most books on handling money, this one is not about arithmetic, nor is it about monthly budgets, compound interest, or capital gains. Instead, it’s about managing the emotional issues of money, especially those resulting from growing up without it. It is about the confusion that can occur in your subconscious mind regarding money, and how we often get it mixed up with other issues of personal interactions. It is about exposing habits that were originally created to help you survive a difficult situation, but may now be preventing you from achieving the happiness and success you seek. It’s about starting a process of self discovery, and healing the trauma of growing up in a “scarcity environment.” It asks far more questions than it answers, but it places faith in you to find the answer that is right for you. Candidates for political office often state that they “want everyone to be rich.” This is a lovely sentiment, but it is impossible to execute. If you have ever wondered why poverty persists despite all our efforts and stated desire to end it, there is an obvious reason for why this is: monetary wealth is relative, and in order for some people to be rich, you have to have other people who are poor. If poor people did not exist, people who want to be rich would have to create them. And throughout history, that is exactly what has been done. Now if you are on the poor person end of the stick here, it is very easy to blame all of your troubles on these abusive carpet-bagging rich people. But this is only one side of the story. Yes, there have always been efforts to exploit and oppress large numbers of people, but it is very hard to oppress large numbers of people for very long unless you can somehow convince them to accept their state of being oppressed. This is where “poor kid thinking” becomes so important. “Poor kid thinking” is not an individual shortcoming. Instead, it is a broad cultural phenomenon. A lot of it comes from the outside, but a lot of it is also self-induced. If you were born into a “scarcity environment” (resulting from mismanagement, economic/political oppression, or maybe just a dry climate), well, let’s face it, you didn’t have much in the way of choices or options. Not only were you constantly having to come up with workarounds just to survive, you were also surrounded by people who were coping with those same privations themselves. This collective and/or inherited “survival mode” – in both physical and psychic terms– may have become an accepted way of life. If your neighbors and your family all fell into this system, well, in your natural eagerness to “fit in” and be accepted by your group (and acceptance by the group is awfully important to all of us), it’s hard to not fall into the culture of “poor kid thinking” along with everyone else. And once you fall into “poor kid thinking,” the “rich people” don’t have to do very much to oppress you any more, as you are now unwittingly doing it to yourself. Many books have been written about how the “lower classes” and poor people in general are victims of oppression. Yes, that is a big part of the story, but it’s not the whole story. Assigning all the blame on someone else blinds us to the many ways in which one’s own “poor kid thinking” serves to perpetuate one’s being poor. This “poor-kid” cultural training, which reinforces behaviors that maintain a state of impoverishment, is just as much to blame as any outside influence. As the saying goes, “if you can’t beat them, join them,” and this book is about leaving the cultural values of “poor kids” behind and joining the ranks of the “rich kids.” It would be nice if the oppressors in your life would have a change of heart, and create policies that would lift poor people like you out of poverty, but, as previously stated, they have no motivation to do so. Even if they did, “poor kid thinking” is highly resistant to accepting any help in becoming rich. So let’s scale back a bit, and instead of thinking about painful history or grand government policy, let’s focus solely on you, and what you have the power to change here and now. 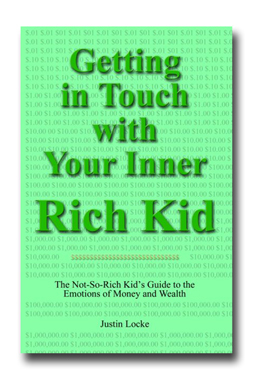 Let’s undo your “poor kid” training, and start turning you back into the “rich kid” you were meant to be. Buy your copy in our Bookstore!